The new national media platform by and for First Nations people was officially launched in Sydney on Friday 23 November. indigiTUBE connects and supports the preservation of language and culture for our future generations. A living modern midden where technology and culture are woven together, MC Dallas Woods declared the official opening of the next big player entering the digital media arena, “indigiTUBE is very important, it’s something that we’ve needed for a long time. Beautiful culture must be preserved”. indigiTUBE has begun its journey to gather First Nations stories from the desert to the sea … connecting and sharing culture from our extremely remote to urban regions; from our fresh new talent to archived histories. indigiTUBE is a digital custodian for First Nations song, dance, language and lore; creating a unified space to share our evolving and living culture. It also live streams 20 different radio stations to hear what's going on around the country. The visually stunning media platform reflects the rich culture of our First Nations people, and the vibrant colours represent ochre, land and sea. indigiTUBE is a message of renewal and promise of change, with First Nations culture claiming its rightful place in current Australian society. Harking back to the old ways of corroboree and campfires nourishing sacred land, First Nations culture is alive and strong. indigiTUBE contributes to the cultural safety and community wellbeing of our First Nations communities. Culturally appropriate content becoming available for viewing by national and international audiences enhances the appreciation for our cultures and languages. It is also an effective online communications resource for First Nations organisations and individuals, providing an appropriate portal for media producers to distribute and access content in a connected digital economy. indigiTUBE will establish itself as the national go-to media platform. It will profile and promote the diversity of our First Nations media content; radio, music, video, oral histories, language resources and also provide an outcome focus to the ongoing task of the digitisation of media archives. We estimate that there are 1000s of hours of archive content locked away and indigiTUBE will provide a centralised access point. ​It will build value for our industry and serve as a promotional tool for artists with links to their sales portals, curating features and helping to build story around artists, contributors and events. Listen and view: Users will be able to start listening and viewing First Nations content from across the country. Contribute: Media organisations, workers and independents will be able to sign up for a free account and contribute content, selecting their preferred options regarding streaming, downloads and airplay promotion. Promote: Additionally, First Nations and community radio stations and broadcasters will be able to contribute content, as well as download content for broadcast from the one account. indigiTUBE is available as an iOS and Android app, as well as an online website media platform with built in social media sharing for users to promote on Facebook and Instagram. Content will be available in the future as an app on services such as Apple TV, Telstra TV, Google TV and Smart TVs. The redevelopment of indigiTUBE has taken into account how people are connecting to and accessing media; the increase of smartphone and tablet use and limited access for remote communities. Contributors have the option to mark their content for streaming, download and airplay. The expansion and redevelopment of the indigiTUBE media platform for profiling First Nations national media services and sharing content is in response to a call from the industry as part of as the national peak body. The indigiTUBE platform was first established in 2008 in response to increased access to the internet and high uptake of mobile phone technology in remote First Nations communities. It also addressed the growing demand for access to appropriate content. IRCA managed the radio streaming and audio content and Indigenous Community Television (ICTV) managing the video content. In 2016 the partnership was completed and the platform retained only minimal content. 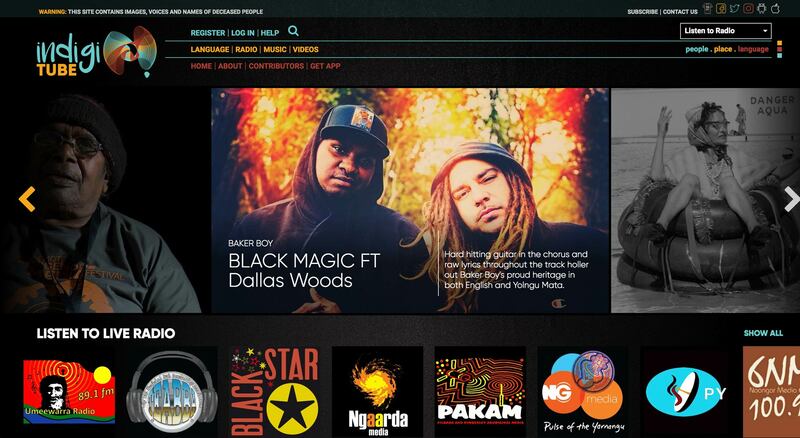 As part of First Nations Media Australia’s new role as the national peak body, there was a strong call from the industry to redevelop and expand indigiTUBE into a national platform. Enquiries to Jaja Dare: jaja@indigitube.com.au. indigiTUBE is a First Nations Media Australia project supported by the Indigenous Languages and Arts Program, and Community Broadcasting Foundation.